The BlueSMiRF is the latest Bluetooth****wireless serial cable replacement from SparkFun Electronics! These modems work as a serial (RX/TX) pipe. Any serial stream from 2400 to 115200bps can be passed seamlessly from your computer to your target. We've tested these units successfully over open air at 350ft (106m)! The latest version of this board also breaks out PIO4. Does any one know what the right number for "RS232 to TTL converter circuit " so I could connect the Bluetooth to my pc? 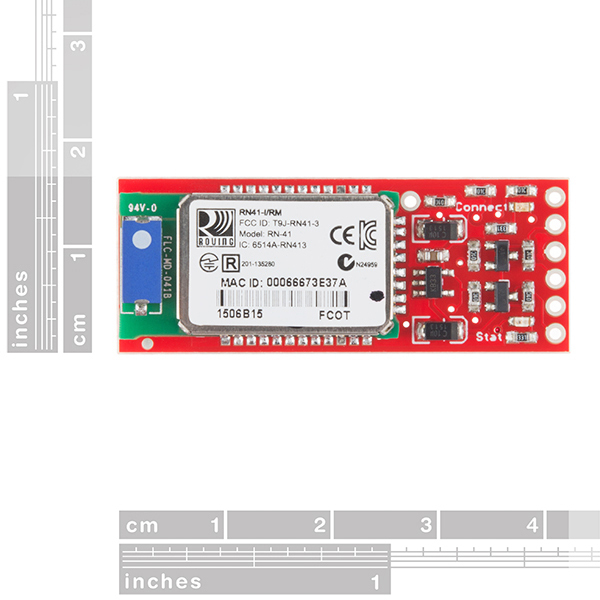 There are plenty of them in Sparkfun website but I have not idea which one fits. Does anyone know how to do a factory reset of the BlueSMiRF Gold ? The data sheet isn't clear about this. I tried setting the pin PIO4 to HIGH multiple times but it didn't worked. A great small unit that works well with the Arduino UNO. I personally have found it is much easier to connect and talk to than other similar Bluetooth devices. I had some issues where removing power from the device meant that it no longer communicated on power up. After a few false starts (command mode, and factory reset using: 'SF,1') to re-establish connection I found that I had to enter command mode, set the bluetooth to the lower baud rate ('SU,96' ; i.e. 9600) to the device, exit the command mode (---) and then run my default bluetooth code. It wasn't enough to just have the baud rate change in my code. Now I can power down and up without communication issues. Hooked up an oscilloscope, nothing seems to be registering from the TX pin of the bluetooth module... plenty of activity in the RX pin though.... not sure what to make of it. As for Arduino, it appears Due is the only board in existence that cannot use Software Serial due to a different architecture, just my luck.... Does anyone know anything about how to hook up bluetooth on a Due? Is there a command to reset the module to the same state as I received it from Sparkfun? I see a reference to AT command set, but I cannot find any documentation with actual "AT' commands. I see other commands when using the $$$ sequence. What's up? The AT commands are listed in section 2.2 of this datasheet. Weird Problem. I am using a wireless RS-232 replacement at 115,200 baud. Works great, no issues, but if I send an ASCII "2" the connection breaks down. Have to re-start, re-boot, re-connect, whatever. Is this a design feature on purpose? I used the SF,1 factory default and the issue is not there now. ?? I'm using the Arduino code from the Sparkfun instructions. The device is not entering command mode and instead is sitting in start-up mode with out timing out. Which Arduino are you connecting to? Formatting of your post makes it difficult to tell if the pins are hooked up correctly, so that would be the first thing I would double check. A quick power supply question. I am adding this to an embedded design that is powered by 3.3V. This Blue SMiRF Gold board states that it will work at 3.3V but the SMiRF board schematic has a 3.3V LDO regulator on board. Correct me but a 3.3V source voltage may not be able to power this device since it would require a higher voltage than 3.3V to drive the on board LDO. What am I missing here? Trying to release a board layout now and need some advice or help, thanks. They are internally connected I believe. Guys I so sorry, I was very afraid, by not to find nothing, really sorry. You Know when is unknown something, by any word more easy that is, it's complicated understand. Hello guys, can you help me? 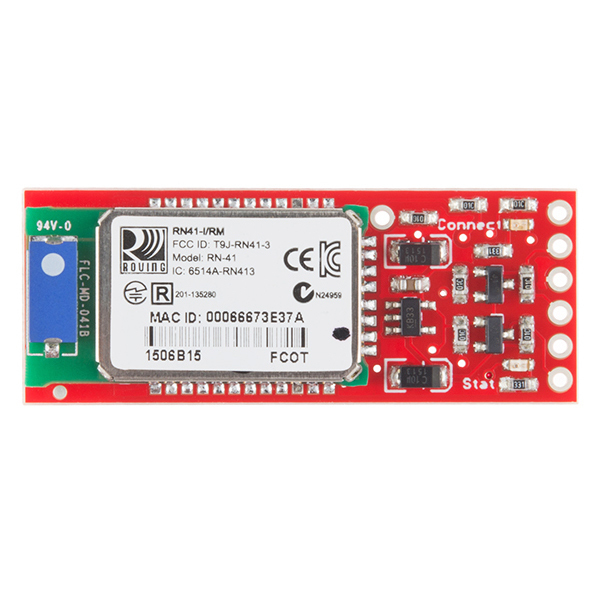 ?, so I have a modem BlueSMIRF GOLD and an ARDUINO UNO CARD, I need to change the Name, the Password, and Baud.- How I can connect physically both devices for to do this?. Can I do this with AT commands througth an arduino sketch? If that doesn't help contact tech support (techsupport@sparkfun.com). Also, try not to spam the comments section with multiple questions. Hello all; I am experiencing an interesting issue...I am not able to figure out whether this due to my code or a hardware problem. I was hoping to gauge you all to see if anyone has experienced this. Although the documentation states that such a state is NOT possible, I have experienced it. I have purchased over 20 of these for a project and I have experienced this with 3 of them (although I have not tested each one extensively). Can this BT connect to uart/serial port APM 2.5 3drobotics? I couldn't find a pinout for 2.5, but my guess is that you likely can interface them. ello guys, can you help me? 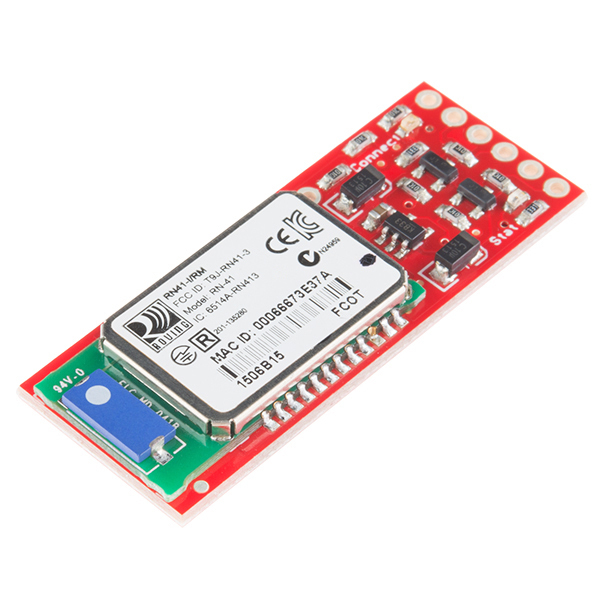 ?, so I have a modem BlueSMIRF GOLD and an ARDUINO UNO CARD, I need to change the Name, the Password, and Baud.- How I can connect physically both devices for to do this?. Can I do this with AT commands througth an arduino sketch? We have examples on how to change these things on this tutorial. If you want to use this with an Arduino, you would simply send these commands over a serial connection between the Arduino and the BlueSMIRF. Could this be used to connect to an iPhone or Android device using an application? curious about that 10K series resistor to the RX pin in lieu of level shifting. is there an internal resistor that's forming a divider? the way it seems, a 5V microcontroller would fry that pin after a while... can't find any documentation on this in the datasheet. Is it possible to attach an antenna to this such as the 2.4GHz Antenna - Adhesive (U.FL connector) from sparkfun? not without a bit of effort. there is no place to put the antenna, but you theoretically COULD take off the chip antenna and rig something up. I wanted to implement a point-to-multipoint piconet. 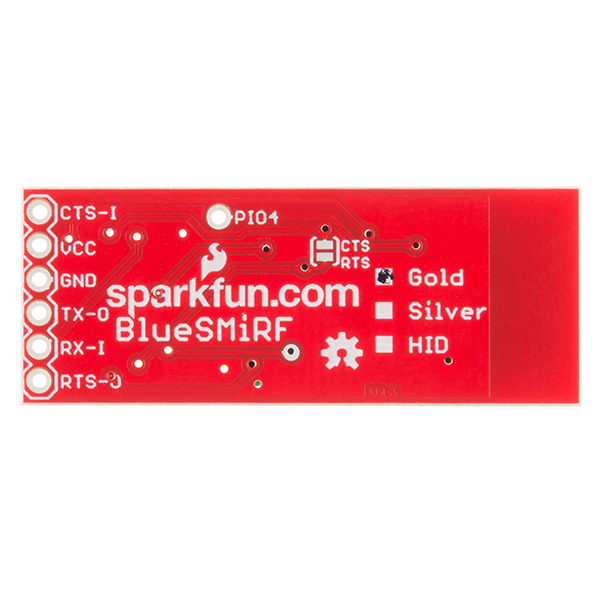 Since a document I found on the Sparkfun website talked about that very thing, I assumed the bluesmirf would support it. I was disappointed to learn that it doesn't. I tried a serial point-to-point scheme, but it takes several seconds to connect, and that's too slow for my application. Solder on some pin headers, connect this baby to your Arduino's UART, and you're ready to talk to a mobile device or laptop. Works like a charm with PyBluez, too! Tried this module as a Bluetooth interface to a serial port. Configured the module to 57600 baud (which is the port speed on my device) and had multiple instances of either corruption or choking on the speed. I was hoping to use this module to gain a bit more distance with its more power, but even at 3 feet it just could not handle the data flow. If you are using it for audio or something where static is OK, then this is for you. For applications where you need the data to reliably get from point A to point B, then not so good. I think they are trying to pack too much into the module? I don't know. Roving Networks doesn't exist any more, so there is no support either. I guess MicroChip bought them out and kind of abandoned the product line. We used to be able to talk directly to the tech guys at Roving in the old days. I found that the cheap BT modules from China are far superior for the simple BT-to-SPP applications even though they don't have the most powerful radios in them. It's very strange, I was just expecting more for 7X the price of the China modules. This module was purchased to replace a RF system that was giving us trouble in the prototype phase. Once I got this unit wired up it was easy to use and wonderfully simple. The hardest part was finding an android app that would do what I wanted it to do. Changing the settings is really easy once you have a Bluetooth terminal running. I was able to do all of the settings adjustment on the fly with my phone! It has been a blessing to work with. I plan on figuring out how to get this module into many of my future projects. Extremely easy to interface to and get running. Sparkfun's quick shipping gave me the edge I needed to get my project started quickly. The module interfaced easily and was very simple to get working. My only problem is that occasionally the module will freeze. I cannot tell if the module's buffer is filling or if it is receiving a certain string to go into a command mode; either way it freezes until reset now and then. I would use this for prototyping but more research would be needed before I would consider depending on this for anything critical. SMiRF surveillance has never been easier with this module. Once I figured out how to program the name and baud rate the BlueSMiRf works great... very reliable and solid connection each time. Programming the module is not straightforward. You have to follow the Hookup guide closely and hold your mouth just right while lifting your left leg to put the module into command mode. Great module otherwise. I will buy more.